Koç Finansman is the only financing company to offer loan services to all brands and industries. 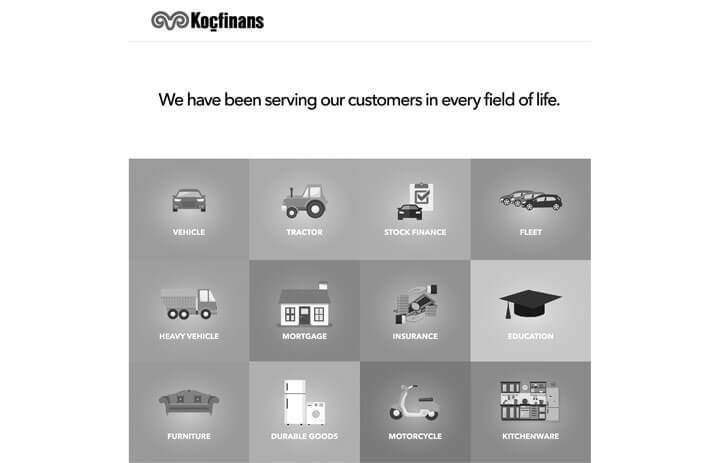 Established to provide customers with financing alternatives at sales locations, Koç Finansman delivers loan services, primarily in the automotive sector, but also in mortgage, education, durable goods and other areas. Koç Finansman is the only financing company to provide a service independent of the brand and sector in question. Financial solutions are delivered without the intermediation of branches, directly by the dealers who sell the products and services covered by the loan. Celebrating its 20th anniversary in 2015 around the theme "20 Splendid Years," Koç Finansman conducts operations on two cultural axes: Innovation and customer focus. This approach has helped the Company win various awards in the areas of technology and social responsibility. In line with its portfolio diversification strategy, Koç Finansman ventured into the durable goods and consumer electronics areas, forged new partnerships and launched the Kredidakik brand. In 2015, the Company's short term national credit rating was affirmed as (TR) A1, while its long term national credit rating was upgraded from (TR) A to (TR) A+. Koç Finansman is keen to diversify its business lines and services, maintain a competitive edge, and bolster its market position with customer-focused, innovative projects in 2016.